April 15, 2013. The day of the Boston Marathon bombing is crystal clear, yet the week that followed was utter chaos. I’m not sure national news painted a clear picture of what was really happening in the city I called home at the time; if you weren’t living it, it was simply impossible to keep up. Every hour, there was always a new threat, suspect or strong suspicion. By the time word spread to the rest of the world, the local Boston Twittersphere had cracked the case, survived a bomb threat and been put on another lockdown. It was horrible. I’ve never been more scared in my life, but I’ve also never felt more united as a community. People tend to have strong opinions about Boston (ever heard the term ‘Masshole’? ), but in the days and weeks following the 2013 Boston Marathon, its people came together and cared deeply for each other. Fear turned to intense pride as I was touched by the ‘Boston Strong, no questions asked’ approach the city, its officials and its first responders took to the situation we found ourselves in. But then again, of course we were Boston Strong. Waddyah think we wah gonnah do, give up? No. We are fighters. And this year, WE WILL RUN. While the days between crime and capture were filled with tears, uncertainty and grief, they were also filled with love, light and support. The word ‘resilient’ was thrown around the media a lot, and with good reason: Boston came back. Eventually, I stopped having to show ID to cross my street, troops were removed and the city was itself again, though things will never truly be the same. During those dark, uncertain times, what kept us going were the stories of hope. Stories we heard in passing on the marathon route, stories going viral on social media, stories friends experienced firsthand at the finish line. We are captivated by the kindness and generosity of complete strangers, because it makes us believe deep down that all people are good. To honor the 2013 Boston Marathon one year later, here are some of the stories that found happy endings amidst the chaos. If you Google Jeff Bauman, you might not like some of what you see. He lost his legs in one of the blasts, and he’s one of the faces of the wounded that was plastered all over the media to further dramatize the tragedy. But strangers helped Bauman get into surgery within 20 minutes of the attack, and their hustle saved his life. In the last year, he learned to walk on prosthetic legs, he got engaged and he’s an expectant father. He even published a memoir, Stronger. (I’ll say.) Just one of those is enough for most people, but on top of that, he’s become a motivational speaker to boot. Bauman is still adjusting to his new life, but he’s definitely on his way to finding happiness. The couple hadn’t been together long when they traveled to Boston for the marathon, but both were struck with injuries when the bombs went off. Pete lost most of his Achilles’ tendon, plus suffered multiple broken bones and a ruptured eardrum. Rebekah is now confined to a wheelchair. 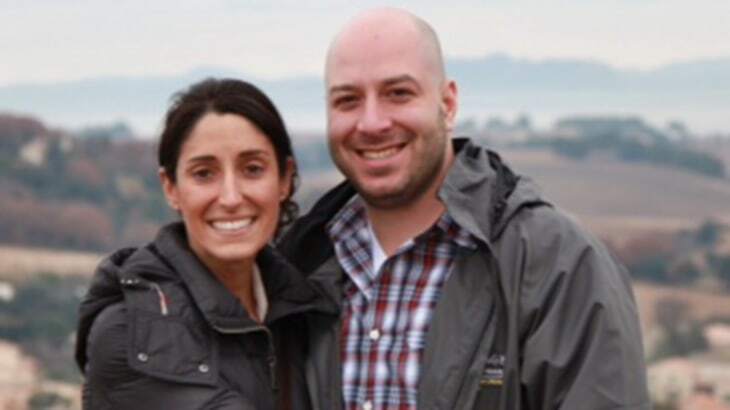 Though they’ve spent most of their relationship recovering from the events of Marathon Monday, it’s made them stronger as a couple, which is why DiMartino proposed to Gregory six months after the attacks. I’m glad they were able to hold on to each other amidst the chaos. James suffered serious burns on his right arm and leg from the blasts. He spent a few weeks in the hospital, physically and emotionally healing from the experience. There, he met a nurse named Krista D’Agostino, and the rest is history. They got engaged on an 11-day cruise that 114 bombing survivors took together to the south of France. Now, though Costello still sees the bombings as a tragic event, he knows it’s one that led him to find the love of his life. Andrew Ruggiero planned his proposal to a T: he was waiting at the finish line Gatorade tent disguised as a volunteer, and had a news crew on hand to film the event. The man got credentials. But you can imagine what happened, or rather, didn’t happen: his girlfriend Melissa Blasczyk was stopped half a mile before she made it to the finish line when the bombs went off. Luckily, Ruggiero wasn’t injured, and the two met up at home. He proposed before she could even take her shoes off. It wasn’t the finish line fairytale he planned, but it’s exactly what they needed: to be together. Those boys played their heart out for Boston. (That’s a lot for a Cardinals fan to admit.) As Papi put it in their first home game following the marathon, “This is our f*%#ing city!” Between the Sox and the Bruins, Boston sports became something for fans to rally behind, especially as the B’s made a run for the Stanley Cup. Did you know Sox third baseman Will Middlebrooks was one of the first to make #BostonStrong a rallying cry for the city? Thank you, boys, for giving us something to cheer about. Even in the darkest of times, there was one thing on peoples’ minds: being with the people they loved. I could go on and on about the uplifting moments following the marathon: the impromptu memorial that formed in Copley Square. Visits from therapy dogs. That time Rene Rancourt dropped his mic and let Bruins fans lead the national anthem. The determination to hold the 2014 Boston Marathon, plus the increased number of participants and volunteers alike. The sheer number of people who gave a damn. It’s amazing. It’s humbling. It’s Boston Strong. I will never be able to explain why a young child had to die that day. But here’s what I did learn: whatever you’re going through, whenever times are tough, know there’s always a light at the end of the tunnel. When things seem bleak, there’s someone, somewhere, willing to help you. I’ve seen the good in people firsthand, and I believe it is in all of us. You are Boston Strong, even if you hate their sports teams.